Auggie Pullman is coming to Showcase Cinemas, and we’re giving you the chance to win a copy of his story plus tickets to see the movie! Enter now for your chance to win a copy of the bestseller Wonder, plus a family 4-pack of tickets to see the movie when it opens on November 17! Wonder tells the heartwarming story of a young boy with a rare facial deformity who has never attended public school before. When he enters fifth grade at his local elementary school, he will have to find the courage to be himself in a strange place where kids are quick to judge him only on his appearance. As he navigates school, making friends, staying true to himself, and choosing kindness above all else, he learns that you can’t fit in when you were born to stand out. The highly anticipated movie adaptation stars Julia Roberts, Owen Wilson, Daveed Diggs and Jacob Tremblay. Tickets are on sale now at showcasecinemas.com. 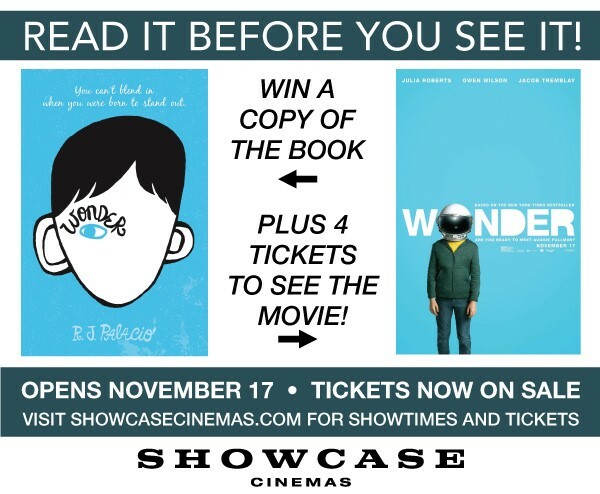 See Wonder when it opens at Showcase Cinemas on November 17!